Here are some pointers on how to easily open and view documents sent with HoGo. If you have received an E-mail that looks like the one below, and does NOT contain a link, then someone has sent you a PDF document using the “Direct Send” method. 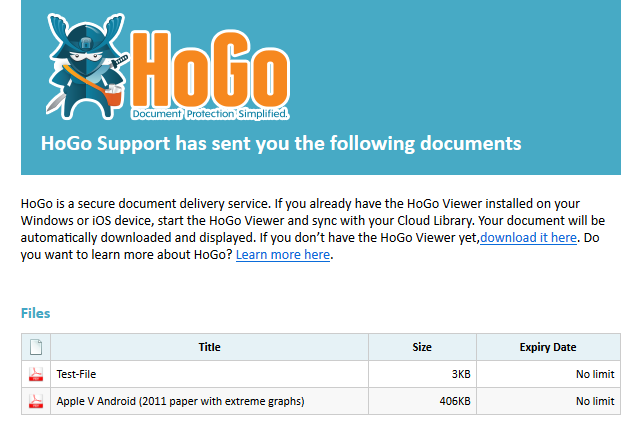 To download and view the document, you must first download and install the HoGo Viewer. The HoGo Viewer is available for Windows, iOS, and Android. Once you have installed the HoGo Viewer, register it using the E-mail address that you received the notification message at. Our server will send you a one-time PIN to register your Viewer. When you have completed registration of your Viewer, it should connect to our server and display a list of documents that have been sent to you. Click on download to download and view the documents. If a list of documents does not automatically appear, then try clicking on the “Cloud Library” button. On Windows, the button can be found on the upper left of your screen as shown below. On iOS it is at the bottom.